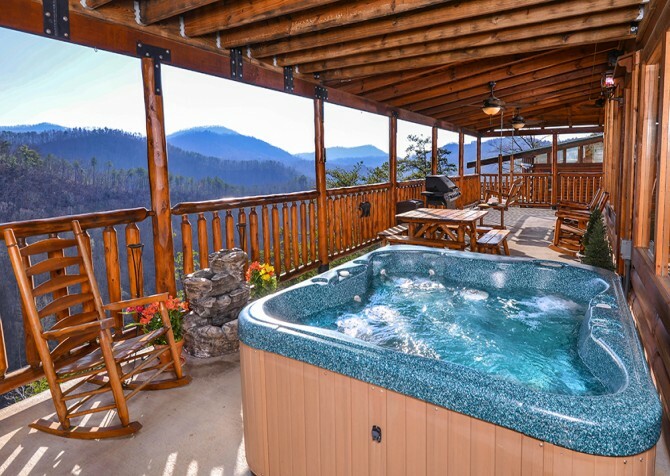 Head swiftly to a world of relaxation — Like a Comet — a 3-bedroom, 3-bathroom cabin in the gated Brother's Cove community in the Smoky Mountains. Filled to the brim with entertaining amenities, the good times will come naturally as you enjoy movie night on the big screen TV with surround sound and HBO, play endless rounds of pool and arcade games in the rec room, soak away your cares in the outdoor hot tub, and unwind in your bedroom’s indoor jetted tub. Cook up delicious meals in the fully equipped kitchen and sip endless cups of joe before breathtaking mountain views! Head straight into the living room just off the front door and take a well-deserved rest on the inviting sleeper sofa or love seat. With incredible mountain views all around, your vacation starts here. Set out buttered popcorn and a variety of drinks on the large coffee table for movie night on the big screen TV with the provided DVD player. An action flick is highly recommended to make good use of the surround sound! Don’t want to bring DVDs from home? No problem! Find a great flick on HBO! At the end of the day, relax in the wooden rocking chair — upon closer look, you’ll see that nature itself must’ve had a hand in its making. And on cold mountain nights, curl up in front of the wood-burning fireplace here. With an open floor plan, the beautiful Smoky Mountain views can also be seen from the fully equipped kitchen. Granite countertops, stainless-steel appliances, plenty of space…the chef of the family will feel right at home. Store restaurant leftovers in the fridge, bake tasty treats in the oven, brew a classic Colombian blend in the coffeemaker, wash veggies in the double sink, heat easy dinners in the microwave, and let the dishwasher take care of the mess. Just off the kitchen, the dining room features a wooden table with 6 cushioned chairs, awaiting bountiful breakfasts, flavorful lunches, and delectable dinners. With a wrought-iron chandelier and large windows, this cozy room is very well lit, creating the perfect workspace for professional and aspiring artists alike. Clear the table and put pen to paper, pencil to pad, and crayon to book — all artwork is welcome here. Head upstairs to the rec area in the loft for a couple rounds of pool, arcade games on the multicade, or a friendly chat on the sofa — first one there gets the recliner! Enjoy a unique view of the Smokies from the large, floor-to-ceiling windows or venture up the spiral staircase for another cool view and a great selfie shot. If you find it difficult to leave the comfortable space, claim it for your own by sprawling out on the twin day bed. On the entry level lies a spacious bedroom — complete with an en-suite bathroom, a gas fireplace, and an indoor jetted tub. While a chick flick plays on the flatscreen TV, enjoy a warm fire and a nice bubble bath before heading to the king-size bed. On the second floor awaits the master suite — featuring a king-size bed, an en-suite bathroom, a flatscreen TV, a gas fireplace, an indoor jetted tub, and a private covered deck. With all these amenities and more, it will be easy to relax and hard to leave. On the third floor, at the top of the spiral staircase, a quaint bedroom boasts a flatscreen TV, a private covered deck, a full-size bed, and an en-suite bathroom. Watch the latest episode of your favorite show, enjoy evening views from the rocking chairs on the deck, and sleep until noon or all day — this is your vacation, after all! Need some extra sleeping space? The cabin also has 1 day bed and 1 sleeper sofa! Pull up to an architectural beauty with parking for 3 (motorcycle friendly) on the flat, paved driveway. Awake to stunning morning views with a cup of coffee in hand as you relax in a rocking chair on your private deck. Head to the entry-level deck for relaxing soaks in the hot tub with the soothing sounds of a water fountain nearby or host a barbecue party with the gas grill and convenient picnic table. While dinner’s being cooked, unwind in the porch swing or rocking chairs and keep cool under the ceiling fans. As a member of the gated Brother’s Cove Resort, Like a Comet provides community pool access, so the kids can happily splash around in summer. With this Pigeon Forge cabin’s convenient washer and dryer, pack light to leave more room for souvenirs. Last but not least, this cabin boasts high-speed internet, giving you the power to easily keep all your social media accounts up to date. For a bit of city fun, venture downtown to the heart and soul of Pigeon Forge. Enjoy dinner shows, intriguing games, wondrous amusement parks, unique museums, and more! As the name suggests, you can ride a mountain coaster through the trees and feed adorable goats, too — preferably not at the same time — at The Coaster at Goats on the Roof. Get ready to laugh your pants off (figuratively) as you dine on southern cooking and watch one of the funniest shows around at the Comedy Barn Theater! Featuring tons of rides, scrumptious eateries, fantastic shows, seasonal festivals, and more, Dollywood will keep you smiling all day, so be sure to bring your best camera!